As a press photographer for the Israeli newspapers "Ha'aretz" and "Ma'ariv ", Miki Kratsman has had access to locations that are inaccessible to the general population. For the past fourteen years he has focused on the occupied territories and the difficult routines of daily life there. While working in Gaza and the West Bank, Kratsman has established relationships with Palestinian families. 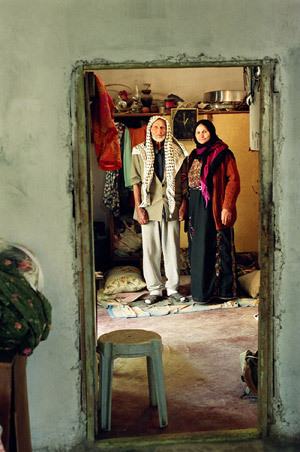 Thus his photographs taken in Palestinian homes have an arresting intimacy. In the pictures displayed here, a Muslim couple is shown at the Dahaisha Refugee Camp and a Christian couple is shown sitting before a portrait on the wall of their child who was killed by a stray bullet (the child can also be seen in a pendant on the woman's necklace). Kratsman dramatizes how both couples are burdened by memories of past events.